I encounter errors while upgrading to Mus2okur version 2008.11 or updating my software with this version. What steps do I need to take? 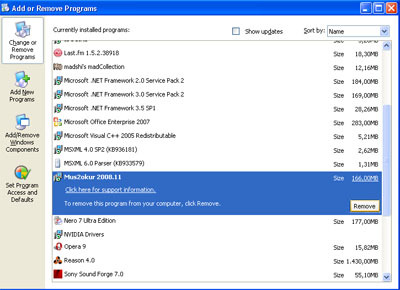 In the list of installed programs, remove alll Mus2okur items. 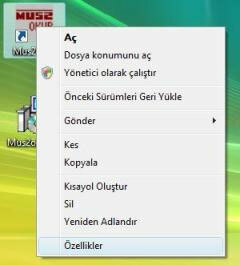 If the folder where you had installed Mus2okur previously (usually "C:\Program Files\Mus2okur") was not deleted, open "Computer" or "My Computer", find this folder and delete it. Re-install Mus2okur version 2008.11. If you have already activated your software, you will not need to activate again. However, you will need to re-install the full database either from the Mus2okur Install CD or from the Internet. What do I need to do to run Mus2okur under Windows Vista? Note: The steps below are not necessary for Mus2okur version 2008.11 or newer. After installing Mus2okur, right-click the application shortcut and choose "Properties". The dialog below appears. Make sure the "Run this program as Administrator" box is checked and click OK.
Click the Start button and select "Control Panel". Click the "Turn User Account Control on or off" link as shown in Figure 1. Change the "Use User Account Control (UAC) to help protect your computer" box to its opposite state as shown Figure 2, i.e. if it is checked, uncheck the box; if it is unchecked, check the box. Update Mus2okur. Once the update procedure is complete, change the User Account Control box back to its original state. Is it possible to save usul patterns as a MIDI file? In the Scores/Lyrics section, select a musical work composed with the usul you want to save as a MIDI file and click the play button next to the "MIDI File" label. This will save the selected work as a MIDI file in the location displayed (e.g. "C:\Program Files\Mus2okur\Temp\" with a file name like "M0562.mid"). This file can be opened by any MIDI sequencer and includes the rhythmic patterns in its last 2 tracks (one in the regular form and the other in the velveleli form). How do I change the size of a table? In most sections of Mus2okur, the tables and notation regions in a window can be resized by dragging the edges of these regions. When the mouse is at the edge of a region, the cursor changes to a "resize" icon. In the Settings tab of Mus2okur, try selecting all the MIDI devices in the MIDI Device Selection and Calibration window one by one, clicking one of the numbered buttons after each selection to see if you hear any sound. I can't see scores under Windows XP. Go to Control Panel, open the Add/Remove Programs applet and uninstall all earlier versions of Adobe [Acrobat] Reader. Install Adobe Reader 7 from the setup program found in the \Program Files\Mus2okur application folder. Data in a table is sorted incorrectly. Each table has a default sorting order. This can be changed by clicking one of the headers in the table. Clicking on the same header will toggle between ascending and descending order. For example, clicking on "Date of Birth" will sort the table by dates of birth instead of names.